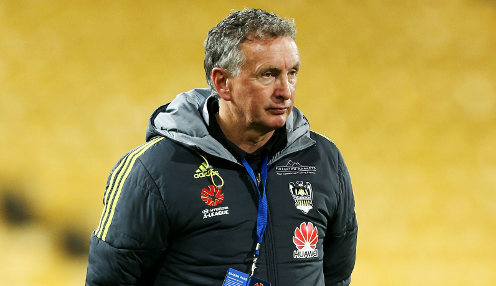 Another 10 points from their last five games will give Newcastle Jets a good chance of playing in the A-League Finals Series, coach Ernie Merrick believes. Last season's beaten Grand Finalists missed the chance to close the gap on the top six at the weekend when they lost 3-2 at home to bottom side Central Coast. We've now only got five games to win three, and maybe get a draw ... it's not impossible. Had they won the F3 derby at McDonald Jones Stadium they would have been just two points behind sixth-placed Adelaide United. Instead they have a five-point gap to make up over the final five rounds, three of which will be on the road. Merrick has remained confident throughout the season that the Jets will claim a top-six spot, and the defeat to the Mariners hasn't changed that. "It makes it tougher, but what I said to the boys right from the start is that it isn't all about this [Mariners] game," said the coach. "That still stands, but we've now only got five games to win three, and maybe get a draw ... it's not impossible." The Jets run-in sees them travel to two sides in the top six - they go to Wellington Phoenix on 30th March for their next match and will take on leaders Perth Glory on 14th April. Merrick was disappointed with his team's display against the Mariners, who were playing their first game under interim coach Alen Stajcic. "We had the bulk of the play, we had 24 shots to five, out of those 24 there were eight or nine really quality chances to score goals but didn't take our chances, he said. "We lost the game in the first half and we didn't get any better in the second half, we only played 15 minutes of good football." Newcastle Jets are 14/1 to finish in the top six. The Jets are 6/4 to win their next game against Wellington Phoenix, who are 13/8 with the draw 5/2.